It has been far too long between posts. Now that I am well settled in my new home and have retired permanently from my teaching, I have decided to post a recipe a month on this site as well as anything else I find topical. The month of Ramadan started a few days ago and since dates figure prominently in the breaking of the fast each evening, I have decided to post this date cake which contains both dates and walnuts and plenty of butter which keeps it moist for days. Looking forward to your comments. Enjoy! Cream the butter and sugar. Beat in the eggs and stir in the dates with their soaking water and the chopped walnuts. Fold in the flour and pour into a well greased ring tin. Bake in a moderate oven 45 mins. Blend the dry ingredients with the coffee and vanilla essence adding just enough milk to make a smooth icing. 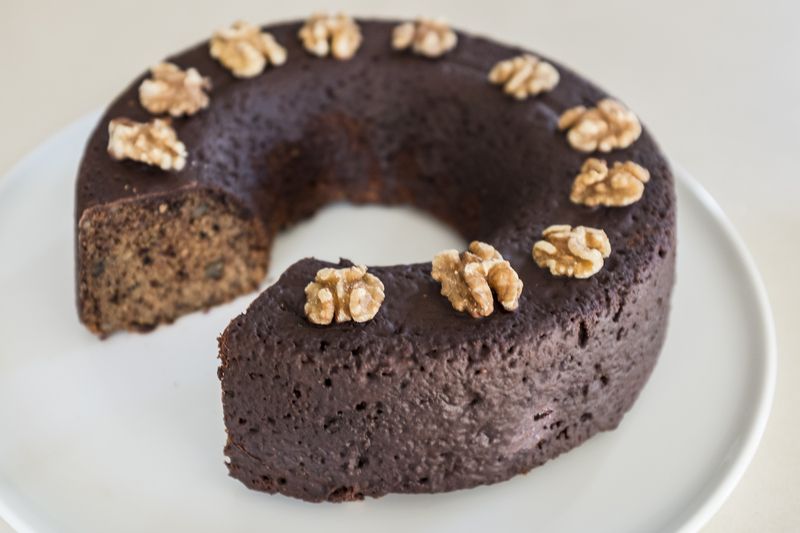 Ice the cooled cake and decorate with walnut halves. Yum! I’m going to make this today. What kind of coffee should I eus? I use a very short black but you can even use instant dissolved in the milk.